Idealized climate change simulations are used as benchmark experiments to facilitate the comparison of ensembles of climate models. In the fifth phase of the Coupled Model Intercomparison Project (CMIP5), the 1 % per yearly compounded change in atmospheric CO2 concentration experiment was used to compare Earth system models with full representations of the global carbon cycle in the Coupled Climate–Carbon Cycle Model Intercomparison Project (C4MIP). However, this “1 % experiment” was never intended for such a purpose and implies a rise in atmospheric CO2 concentration at double the rate of the instrumental record. Here, we examine this choice by using an intermediate complexity climate model to compare the 1 % experiment to an idealized CO2 pathway derived from a logistic function. The comparison shows three key differences in model output when forcing the model with the logistic experiment. (1) The model forced with the logistic experiment exhibits a transition of the land biosphere from a carbon sink to a carbon source, a feature absent when forcing the model with the 1 % experiment. (2) The ocean uptake of carbon comes to dominate the carbon cycle as emissions decline, a feature that cannot be captured when forcing a model with the 1 % experiment, as emissions always increase in that experiment. (3) The permafrost carbon feedback to climate change under the 1 % experiment forcing is less than half the strength of the feedback seen under logistic experiment forcing. Using the logistic experiment also allows smooth transition to zero or negative emissions states, allowing these states to be examined without sharp discontinuities in CO2 emissions. The protocol for the CMIP6 iteration of C4MIP again sets the 1 % experiment as the benchmark experiment for model intercomparison; however, clever use of the Tier 2 experiments may alleviate some of the limitations outlined here. Given the limitations of the 1 % experiment as the benchmark experiment for carbon cycle intercomparisons, adding a logistic or similar idealized experiment to the protocol of the CMIP7 iteration of C4MIP is recommended. MacDougall, A. H.: Limitations of the 1 % experiment as the benchmark idealized experiment for carbon cycle intercomparison in C4MIP, Geosci. Model Dev., 12, 597-611, https://doi.org/10.5194/gmd-12-597-2019, 2019. Idealized climate change experiments are used as common framework to compare the output of ensembles of climate models (Houghton et al., 1996). These experiments are used to estimate standard Earth system metrics such as climate sensitivity (Gregory et al., 2004), transient climate response (Houghton et al., 2001; Raper et al., 2002), and transient climate response to cumulative CO2 emissions (TCREs) (Gillett et al., 2013). Two of the idealized experiments outlined by the Coupled Model Intercomparison Project (CMIP) prescribe changes only in atmospheric CO2 concentration: the 4× CO2 experiment and the 1 % per year compounded increase in atmospheric CO2 experiment (hereafter referred to as the 1 % experiment) (Meehl et al., 2007; Taylor et al., 2012; Eyring et al., 2016). Using either of these experiments allows for the study of the effect of CO2 on the Earth system without having to account for the confounding effects of land use change, non-CO2 greenhouse gases, and aerosols. The 4× CO2 experiment prescribes an instantaneous quadrupling of atmospheric CO2 concentration (relative to pre-industrial concentration) and is principally used to estimate equilibrium climate sensitivity (Gregory et al., 2004; Rugenstein et al., 2016). The 1 % experiment prescribes a rise in atmospheric CO2 concentration from pre-industrial concentration at 1 % a year compounded, resulting in a doubling of CO2 concentration at year 70 of the simulation, and a quadrupling of CO2 concentration at year 140 of the simulation. The 1 % experiment has principally been used to derive the transient climate response, defined as the temperature change at the time of atmospheric CO2 doubling in a 1 % experiment (Houghton et al., 2001; Collins et al., 2013). As part of CMIP phase 5 (CMIP5), the 1 % experiment was used to compare the carbon cycle feedbacks within Earth system models (ESMs) (Taylor et al., 2012; Arora et al., 2013) and to derive values of TCRE and thus to compute carbon budgets compatible with various temperature targets (Gillett et al., 2013). A similar modelling protocol has been established for forthcoming CMIP6 simulations (Jones et al., 2016b). Here, we critically examine this choice and propose a more suitable idealized experiment for examining carbon cycle feedbacks to climate change. The first documented use of the 1 % experiment was by Stouffer et al. (1989) where the experiment was used to force an early ocean–atmosphere general circulation model developed by the Geophysical Fluid Dynamics Laboratory (Ronald J. Stouffer, personal communication, 2017). 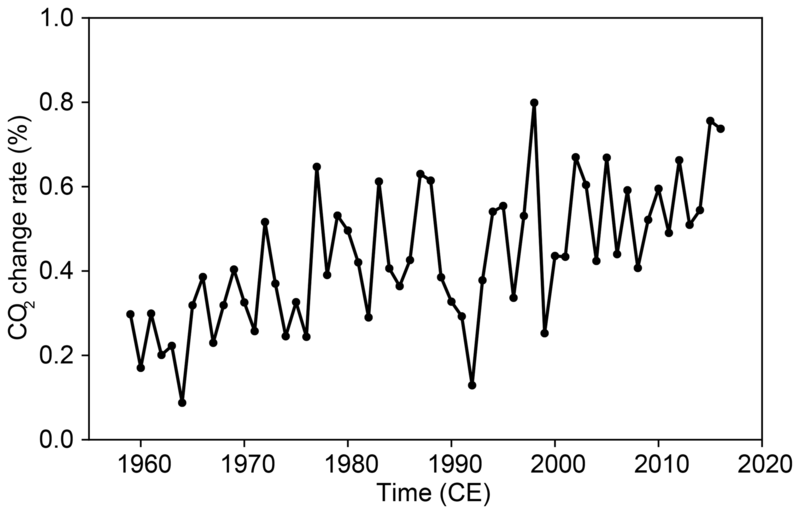 The 1 % rate of increase was chosen to approximate the rate of increase of all anthropogenic greenhouse gases observed at the time of Stouffer et al. (1989) (while not accounting for cooling from aerosols, a process that was poorly quantified in the 1980s; Houghton et al., 2001). 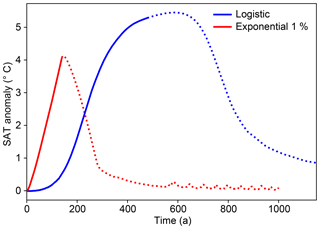 The exponential functional form of the experiment was chosen because radiative forcing from CO2 is approximately a logarithmic function of change in atmospheric CO2 concentration. Therefore, an exponential rise in atmospheric CO2 at 1 % a year compounded results in a 1 % a year linear increase in radiative forcing at the top of the atmosphere (Stouffer et al., 1989). Thus, the increase in CO2 was intended to represent the rise in all greenhouse gases. It was well understood that CO2 concentration rose much faster in the 1 % experiment than CO2 concentration was expected to rise in the natural world (Stouffer et al., 1989). Since yearly records began in 1958, the annual rate of change in atmospheric CO2 concentration has ranged between 0.09 % in 1964 and 0.8 % in 1998 with a mean of 0.43 % from 1958 to 2016 (Fig. 1). The numerical experiment of Stouffer et al. (1989) was included in the First Assessment Report of the Intergovernmental Panel on Climate Change (IPCC) (Houghton et al., 1992), and by the time of the Second Assessment Report, the 1 % experiment had become a standard benchmark numerical experiment for climate model intercomparison (Houghton et al., 1996). In preparation for CMIP6, the 1 % experiment has been incorporated into the CMIP Diagnostic, Evaluation and Characterization of Klima (DECK) protocol, intended to be the CMIP core set of experiments for the indefinite future (Eyring et al., 2016). Figure 1Historical yearly rate of atmospheric CO2 change derived from the Mauna Loa record (Trans and Keeling, 2017). Note that the annual rate of increase has never breached 1 % a year and has averaged 0.46 % a−1 over the historical record. The development of Earth system models (climate models including carbon cycles; Planton, 2013) created a need for a transient CO2-only experiment for use in model comparisons of this new class of model (Friedlingstein et al., 2006). In the first intercomparison of ESMs, a modified version of the Special Report on Emissions Scenarios A2 experiment was used, where non-CO2 forcing and land use changes from the scenario were turned off for the simulation (Friedlingstein et al., 2006). However, later studies utilizing model output from the Coupled Climate–Carbon Cycle Model Intercomparison Project (C4MIP) implicitly criticized the choice of the A2 scenario (Gregory et al., 2009; Matthews et al., 2009). Gregory et al. (2009) recommended using the 1 % experiment in place of a modified scenario, due to the simplicity of the 1 % experiment, the experiment's well-established role in model intercomparison projects, and the magnitude of emissions implied by the 1 % experiment to be of similar magnitude to socioeconomic scenarios. This recommendation was implemented, with the CMIP5 protocols calling for benchmark carbon cycle experiments to be carried out using a 1 % experiment (Taylor et al., 2012). The protocol for the CMIP6 iteration of C4MIP also calls for the 1 % experiment to be used at the benchmark for carbon cycle model intercomparison, along with a selection of scenario-based simulations (Jones et al., 2016b). The carbon cycle is classically subdivided into the terrestrial carbon cycle, dominated by plant and soil biology, and the oceanic carbon cycle, dominated by ocean carbonate chemistry but influenced by ocean biogeochemistry (Ciais et al., 2013). Together, these processes remove over half of the carbon emitted to the atmosphere by burning of fossil fuels and land use change, greatly mitigating the effect of CO2 emissions on climate change (e.g. Le Quéré et al., 2018). In the terrestrial domain, there are three major feedbacks that are induced by increases in atmospheric CO2 concentration and resultant climate warming. The response of plants in CO2-limited ecosystems to increased atmospheric concentration of CO2 is the CO2 fertilization effect, whereby primary productivity is increased leading to larger plant biomass and an increased flux of dead biomass into soils (e.g. Ciais et al., 2013). The rate of heterotrophic respiration of soil organic matter is strongly controlled by temperature (Jenkinson et al., 1991), such that warmer soil temperature tend to induce a faster overturn of soil organic matter and release of carbon to the atmosphere (Jenkinson et al., 1991). This enhanced soil respiration is especially significant in permafrost environments, where the switch from dominantly frozen soils to dominantly thawed soils dramatically increases the rate of respiration and can lead to the release of long-sequestered pools of carbon (Schuur et al., 2015). The third major feedback affecting the terrestrial realm is ecosystem changes resulting from climate warming and can be either a positive or negative feedback depending on the region of the world (e.g. Malhi et al., 2009; Ciais et al., 2013). In the ocean domain, uptake of carbon is driven by the difference in the partial pressure of CO2 (pCO2) between the surface ocean and the atmosphere (e.g. Greenblatt and Sarmiento, 2004). Where atmospheric CO2 concentration is higher than local sea surface pCO2, atmospheric CO2 will invade the ocean system. Due to ocean carbonate chemistry, most of the carbon that enters the ocean reacts to bicarbonate ions, with a relatively small fraction held as dissolved CO2 – the species that controls ocean pCO2 (e.g. Greenblatt and Sarmiento, 2004). Like most gases, dissolved CO2 has a higher partial pressure in warm water relative to colder water such that climate warming is expected to reduce the efficiency of ocean carbon uptake (Ciais et al., 2013). On centennial timescales, the ocean has a relatively fixed alkalinity, such that the ocean carbonate chemistry equilibrium will shift to a state where more carbon is held as dissolved CO2 – an effect which also reduces the efficiency of ocean carbon uptake (Broecker and Peng, 1982). Over longer time periods, the ocean will increase its alkalinity by dissolving calcium carbonate from ocean sediments, allowing the ocean to absorb additional CO2 from the atmosphere (Archer, 1996). Thus, the ocean is expected to become less efficient at absorbing carbon as CO2 emissions continue but is expected to continue to be a carbon sink far into the future (Arora et al., 2013). However, feedbacks involving ocean biogeochemistry and changes in overturning circulation remain important but poorly quantified uncertainties (Jones et al., 2016b). Carbon cycle feedbacks are affected both by the concentration of atmospheric CO2, air temperature, and the rates of change of these qualities (e.g. Greenblatt and Sarmiento, 2004). A faster rise in atmospheric CO2 will increase the partial pressure gradient between the atmosphere and the ocean, tending to increase the rate of ocean carbon invasion; however, the ocean will have less time to overturn the mixed layer tending to reduce the invasion rate. The CO2 fertilization effect depends on CO2 concentration but the buildup of carbon in soils from higher primary productivity, and thus enhanced soil respiration, depends on the rate of change of CO2. Permafrost carbon feedbacks in particular are sensitive to the rate of change in temperature, as it takes time to thaw soils and decay the highly recalcitrant permafrost carbon pool (e.g. Schuur et al., 2015). Therefore, using the 1 % experiment as the benchmark for carbon cycle model intercomparison may be problematic given that CO2 rises in the experiment at twice the historical rate. Such concerns are supported by a recent study utilizing an intermediate complexity ESM with a representation of the permafrost system and forced with the 1 % experiment. The study showed a permafrost carbon feedback strength evaluated at year 70 of the 1 % experiment of only ∼8 % of the feedback strength evaluated in the year 2100 CE of the Representative Concentration Pathway (RCP) 8.5 scenario with the same model (MacDougall et al., 2017; MacDougall and Knutti, 2016). MacDougall et al. (2017) concluded that the 1 % experiment warmed too fast to allow permafrost to thaw. The study recommended a different idealized CO2-only experiment be developed to help evaluate effect of permafrost carbon feedbacks on climate change. Here, we develop such a new idealized scenario and compare it to the 1 % experiment. The University of Victoria Earth System Climate Model (UVic ESCM) is a climate model of intermediate complexity that participates in both the original C4MIP and the CMIP5 iteration of C4MIP (Friedlingstein et al., 2006; Arora et al., 2013). The core of the model is a full three-dimensional ocean general circulation model coupled to a simplified moisture and energy balance atmosphere (Weaver et al., 2001). The UVic ESCM contains a detailed representation the global carbon cycle including oceanic and terrestrial components. The ocean carbonate chemistry is simulated following the protocols of the ocean carbon cycle model intercomparison project (Orr et al., 1999), and ocean biogeochemistry is represented using a nutrient–phytoplankton–zooplankton–detritus ocean biology scheme (Schmittner et al., 2008). The slow dissolution of ocean carbonate sediments follows (Archer, 1996). The terrestrial carbon cycle is represented using the Top-down Representation of Interactive Foliage and Flora Including Dynamics (TRIFFID) dynamic vegetation model (Meissner et al., 2003; Matthews et al., 2004; Cox et al., 2002). The version of the model used in the present study is a modified variant of the frozen ground version of the UVic ESCM which includes a representation of the permafrost carbon pool (MacDougall and Knutti, 2016) and is the same version of the model used in MacDougall et al. (2017) where the limitations of the 1 % experiment with respect to the permafrost carbon feedback were first encountered. negative emissions, a stage used to investigate the behaviour of the carbon cycle during a hypothesized mass deployment of artificial atmospheric CO2 removal technology (e.g. Samanta et al., 2010; Boucher et al., 2012; Zickfeld et al., 2013). Previous studies have used the multi-gas RCP2.6 scenario to examine increasing, decreasing, and negative emissions stages (Jones et al., 2016a). Some studies have used a fifth stage of the emissions pathway where the emission rate is constant (e.g. Krasting et al., 2014). Although useful for examining some problems, such a state is not necessary to capture the likely evolution of CO2 emissions. Thus, an ideal idealized scenario should include both an increasing and a decreasing phase, and allow for a smooth transition to zero emissions or negative emissions potentialities. where CA is the atmospheric CO2 concentration, CAo is the original atmospheric CO2 concentration, CAp is peak atmospheric CO2 concentration, t is time, tm is the midpoint of the function, and k is a rate constant. k and tm are found by fitting the function to the historical CO2 record. CAo is taken to be 280 ppm, and k and tm values for 2×, 4×, and 8× pathways are shown in Table 1; these pathways are displayed in Fig. 2a. Logistic functions are common in nature and appear in systems where growth is limited by finite resources (e.g. Reed and Berkson, 1929). 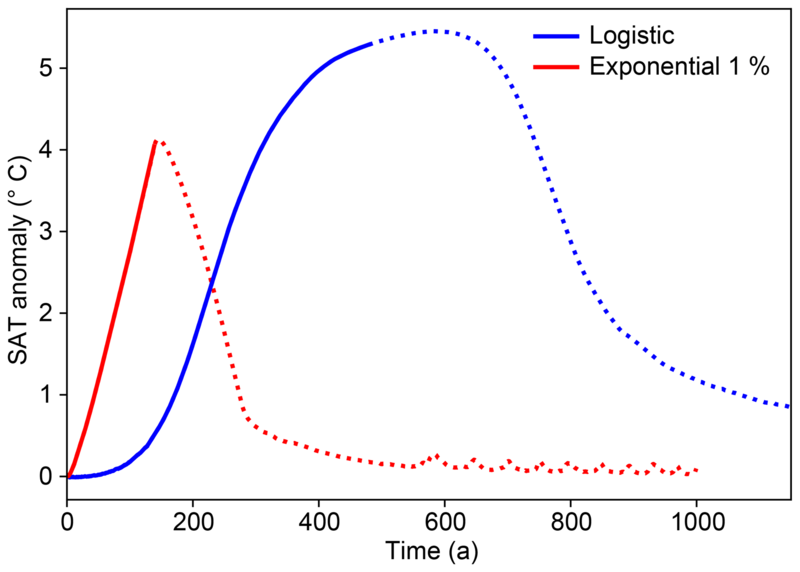 Famously, a logistic equation is one solution to the Verhulst–Lotka population growth equations (e.g. Berryman, 1992), and RCP extension scenarios (except for the peak-and-decline RCP2.6) resemble logistic functions (Moss et al., 2010). Table 1Parameter values for logistic CO2 pathways. The 4× CO2 logistic pathway is compared to the historical CO2 trajectory, the 4× CO2 1 % experiment pathway, and the pathway of Wigley and Schlesinger (1985) in Fig. 3. The Wigley and Schlesinger (1985) pathway was an early alternative to the 1 % experiment the fell out of use before IPCC SAR. 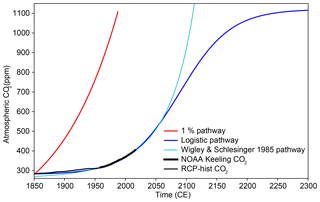 The figure demonstrates how fast CO2 concentration grows in the 1 % experiment relative to the historical record and also how much closer the Wigley and Schlesinger (1985) pathway trends to the post-1985 historical record. Logistic functions asymptote towards their high and low bounds as the function approached positive and negative infinity; hence, how close the function is to the peak and pre-industrial CO2 concentration depends on the match between the logistic function and the historical CO2 record. Treating the year 1850 as the pre-industrial reference time and making the function symmetric about its midpoint lead to pre-industrial and peak CO2 values within 1 ppm of the target value for the three derived pathways. Figure 2CO2 pathways and diagnosed emissions for logistic and 1 % experiments' 2×, 4×, and 8× CO2 mirrored pathways. Solid lines are the increasing CO2 phase of the simulation and dotted lines are the atmospheric CO2 removal phase of the pathways. Note that the logistic CO2 pathways extend over a much longer period of time than the 1 % experiments. Also note that the diagnosed emissions are smooth under the mirrored logistic pathway, while emissions undergo a sharp discontinuity under the 1 %-up, 1 %-down experiment. Figure 3Historical atmospheric CO2 trajectory and three idealized CO2 pathways. Historical trajectories are from the CMIP5 RCP historical archive for 1850 to 1958 (Moss et al., 2010) and from the National Oceanic and Atmospheric Administration (NOAA) record from Mauna Loa for 1959 to 2017 (Trans and Keeling, 2017). In addition to the 4× CO2, 1 %, and logistic pathways, the pathway of Wigley and Schlesinger (1985) (an abandoned alternative to the 1 % experiment) is shown. The UVic ESCM was forced with three versions of the 1 % experiment and three logistic CO2 pathways, with CO2 concentrations reaching a peak of 2×, 4×, and 8× pre-industrial concentrations. Following peak CO2 concentration, model experiments branch to a zero emissions scenario and a negative emissions scenario. In the zero emissions scenario, the model is switched from prescribed atmospheric CO2 to freely evolving CO2 with the fossil fuel emission rate set to zero, such that natural sources and sinks determine atmospheric CO2 concentration (Eby et al., 2009). In the negative emissions scenario, CO2 concentrations return to pre-industrial concentrations in a mirror image of their original rise (Fig. 2). The mirrored return negative emissions scenario derived from the 1 % experiment is the 1 %-up, 1 %-down experiment used by several previous studies (Samanta et al., 2010; Boucher et al., 2012; Zickfeld et al., 2013, 2016; Schwinger and Tjiputra, 2018). The 1 %-up, 1 %-down experiment has been incorporated as a standard model experiment for CMIP6 as part of the carbon dioxide removal (CDR) MIP (Keller et al., 2018). In model simulations where atmospheric CO2 concentration is prescribed, anthropogenic emissions are diagnosed from conservation of mass as the residual of the carbon cycle. The UVic ESCM is being used here simply to illustrate the differences between the behaviour of the carbon cycle in the 1 % and logistic experiments. Replication of the logistic experiment with different ESMs is necessary to confirm the result presented below. In particular, the behaviour of the terrestrial carbon pool is likely to be different in different ESMs (Friedlingstein et al., 2006; Arora et al., 2013). The evolution of atmospheric CO2 concentration under the logistic and 1 % experiments is shown in Fig. 2. The figure also shows the diagnosed emissions for each of the pathways. The emissions for the logistic experiment grow slowly for the first 100 years of the simulation, then enter a stage of rapid increase before reaching peak emissions and going into a decreasing phase. After the peak, emissions decline rapidly before entering a long tail of low but persistent emissions. For the 1 % experiment, emissions monotonically increase through time, with the rate of change in emissions slowing as 2× CO2 is approached but increasing again as 4× CO2 is approached. For the logistic experiments, CO2 emissions peak at 10, 17, and 28 Pg C a−1, respectively, for the 2×, 4×, and 8× pathways. For the 1 % experiments, emissions always peak at the termination of the experiment with values of 21, 29, and 48 Pg C a−1, respectively, for the 2×, 4×, and 8× pathways. For perspective, recall that 2017 anthropogenic CO2 emissions are 11 Pg C a−1 (Le Quéré et al., 2018). A key purpose of carbon cycle models and related model intercomparison projects is to explore how the ocean system and land biosphere carbon sinks will operate under changed climate conditions (e.g. Friedlingstein et al., 2006). One way of visualizing these processes is through the fraction of emitted carbon that is stored in each of the main fast-cycling carbon reservoirs. Hence, we can define airborne, ocean-borne, and land-borne fractions of carbon. These can be defined either as instantaneous fractions, the fraction of carbon emitted this year that ends up in each reservoir, or as cumulative fractions – the fraction of carbon emitted since pre-industrial times held in the ocean, land, and atmosphere. Instant fractions give an immediate sense of how the Earth system is reacting to changes in CO2 concentration and temperature but are not defined once emissions reach zero. 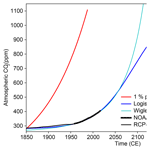 Figure 4 shows the instantaneous and cumulative airborne, ocean-borne, and land-borne fractions of carbon for the logistic and 1 % 4× CO2 experiments. The increasing phase of the logistic experiment closely resembles the 1 % experiment, with closely matched ocean-borne and land-borne fractions early in the simulation, a gradual rise in the airborne fraction of carbon and decline in the land-borne fraction near the end of the increasing phase. In the declining emission phase of the logistic experiment, the carbon cycle behaves differently. As emissions decline, the land system transitions from a carbon sink to a carbon source. The ocean sink comes to dominate the system absorbing more carbon than the anthropogenic CO2 emissions to the atmosphere. 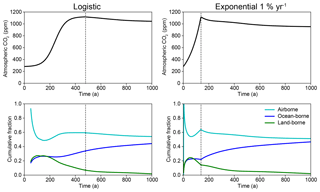 Figure 4CO2 concentration (a, b), instantaneous carbon fractions (c, d), and cumulative carbon fractions (e, f) for the 4× CO2 logistic and 1 % experiments. 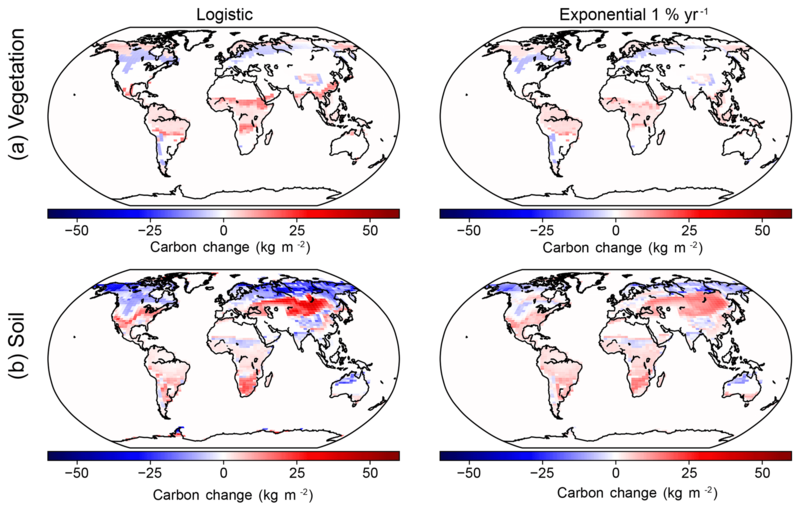 Figure 6 shows the evolution of the land carbon pool anomalies in the 4× CO2 1 % and logistic experiments. The land pool is shown broken down into carbon held in living vegetation, soil carbon, and permafrost carbon (carbon that had been frozen in permafrost soil layers at the beginning of the simulation, which maintains distinct properties after being thawed in the UVic ESCM model scheme; MacDougall and Knutti, 2016). The figure shows that in both experiments the permafrost carbon pool declines monotonically, and vegetation carbon increases with CO2 concentration. However, in the logistic simulation, the soil carbon pool increases to a peak anomaly of 259 Pg C before declining to near zero by the end of the simulation. Under the 1 % experiment, the soil carbon pool anomaly peaks but only just begins a decline before the simulation ends. Hence, an enhanced soil respiration feedback is evident in the logistic experiment but not present in the 1 % experiment. Figure 5 displays the change in vegetation and soil carbon between pre-industrial conditions and the time of doubled atmospheric CO2 under the 4× CO2 1 % and logistic experiments. The spatial patterns of change are similar under both experiments but of greater magnitude under the logistic experiment. Vegetation experiences a loss of carbon in the Andes and in midlatitude northern extratropics, while gains in vegetation carbon are seen in the topics, subtropics, sub-arctic, and arctic regions. Soils show a reduction in carbon in the permafrost region, boreal forests, and the Sahel. Increases in soil carbon are seen in central North America, central Eurasia, and southern Africa, regions generally corresponding to grasslands. Overall, the figure shows complex biome-specific responses of the terrestrial biosphere to increasing atmospheric CO2 concentration. 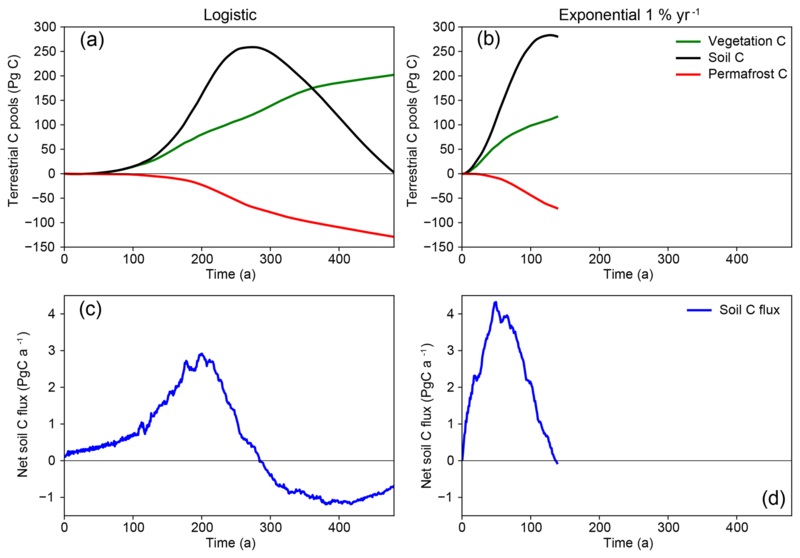 Figure 5Change in carbon content (per unit area) between pre-industrial conditions and 2× CO2 concentration for UVic ESCM simulations forced with the logistic and 1 % experiments: (a) changes in vegetation carbon; (b) changes in soil carbon. Figure 6(a, b) Evolution of terrestrial carbon pool anomalies in the logistic and 1 % experiments. (c, d) Flux of carbon into the soils computed from litter fall minus heterotrophic soil respiration (excluding the permafrost carbon pool). Note that in the logistic experiment the enhanced soil respiration feedback overwhelms the increased flux of litter from vegetation, leading soils to lose carbon – triggering a carbon sink-to-source transition on land. The second key feature of the carbon cycle under declining emissions is the increase in the instantaneous ocean-borne fraction of carbon (Fig. 4b). The feature is explored in Fig. 7, which shows the absolute uptake of carbon by the land, ocean, and atmosphere. The figure shows that ocean carbon uptake does decline in the logistic experiment as the CO2 emission rate declines; however, the ocean remains a sink and by the end of the simulation is absorbing carbon at 1.3 Pg C a−1. Given that in multimillennial ESM simulations the ocean tends to absorb carbon for many centuries after emissions cease (e.g. Eby et al., 2009; Randerson et al., 2015), this feature is not unexpected and is evident for model simulations under the peak-and-decline RCP2.6 scenario in CMIP5 ESM output (Jones et al., 2013). Figure 7Uptake of carbon by the atmosphere, oceans and land systems in the logistic and 1 % experiments. The motivation to create the logistic pathway experiments was the weak response on the permafrost carbon feedback under the 1 % experiment relative to the feedback strength seen under the RCP scenarios (MacDougall et al., 2017). The response of carbon in the permafrost region (including both the modelled permafrost carbon pool and regular soil carbon in the active layer above the permafrost) is shown in Fig. 8. At the midpoint of the 4× CO2 simulations, where carbon cycle feedbacks are classically evaluated (e.g. Arora et al., 2013), the permafrost region has released 19 Pg C under the 1 % experiment and 55 Pg C under the logistic experiment. By the end of each simulation, the permafrost region releases 99 Pg C under the 1 % experiment and 238 Pg C under the logistic experiment. Figure 8 demonstrates the importance of elapsed time in destabilizing permafrost carbon. The logistic experiment implies lower CO2 emission rate, and hence a lower rate of warming, results in a higher release of carbon from permafrost regions at any given CO2 concentration. The result is consistent with previous work on the permafrost carbon feedback, which demonstrates a long lag time between forcing and response due to the time taken to thaw soil and decay soil carbon (e.g. Schuur et al., 2015). Figure 8Release of carbon from permafrost region under logistic and 1 % experiments. Release include both carbon from the permafrost carbon pool and soil carbon from the overlying active layer. 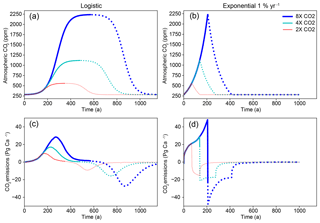 Panel (a) compares the simulations with respect to time, and panel (b) with respect to atmospheric CO2 concentration. 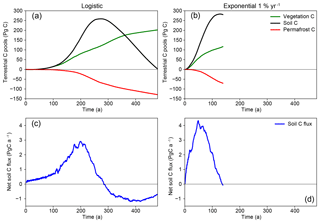 Cumulative emissions versus temperature change curves and TCRE values for the 2×, 4×, and 8× logistic and 1 % experiment simulations are shown in Fig. 9. The TCRE relationship in general shows strong independence from the forcing scenario (e.g. MacDougall et al., 2017), a feature which is evident in Fig. 9. Near the end of the logistic experiments when the rate of implied CO2 emissions slows, the TCRE values deviate from scenario independence. Theoretical work on the TCRE relationship suggests that path independence should break down at very high and very low emission rates (MacDougall, 2017). The results shown in Fig. 9 are consistent with this understanding. At the time of CO2 doubling, the simulated TCRE value is 1.6 Eg C K−1 under all experiments except the 2× logistic experiment where that value is 1.7 Eg C K−1. Figure 9(a) Temperature change versus cumulative emissions curve and (b) TCRE values for all logistic and 1 % experiments. Logistic experiments are shown with dotted lines; 1 % experiments are shown with solid lines. TCRE exhibits strong path independence except near the end of the logistic experiments when the implied rate of emissions slows. An important question posed to ESMs concerns evolution of atmospheric CO2 concentration and global temperature following total cessation of net CO2 emissions (e.g. Matthews and Weaver, 2010; Frölicher et al., 2014). Whether global temperature will increase, decrease, or stabilize following cessation of emissions determines the final size of carbon budgets compatible with temperature targets, and has important policy implications (e.g. Frölicher et al., 2014). The change in temperature following cessation of CO2 emissions is termed the Zero Emissions Commitment (ZEC) (Zickfeld et al., 2012). The evolution of atmosphere CO2 and cumulative carbon fractions following cessation of emissions for the logistic and 1 % experiments is shown in Fig. 10. In both experiments, atmospheric CO2 concentration drops after emissions cease, consistent with most other ESMs (Frölicher et al., 2014). The carbon fractions for both experiments are similar after emissions cease, with the airborne and land-borne fractions of carbon declining and the ocean-borne fraction of carbon increasing. The difference between the logistic and 1 % experiments is most evident at the time emissions stop. 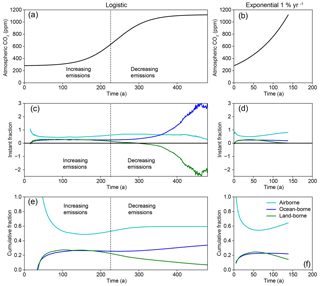 The logistic experiment has a continuous behaviour as emissions increase, decrease, and then reach zero, while the 1 % experiment exhibits a sharp discontinuity in behaviour when emissions cease (Fig. 10). The airborne fraction goes from increasing to decreasing, the ocean-borne fraction goes from stable to increasing, and the land-borne fraction goes from declining quickly to declining slowly. Figure 11 shows the evolution of the surface air temperature anomaly for the logistic and 1 % experiments during the transient simulation and following cessation of emissions. Both experiments have positive ZEC, with the logistic experiment warming 0.6 ∘C between cessation of emissions and year 1000 of the experiment, and the 1 % experiment warming 1.5 ∘C between cessation of emissions and year 1000. Despite having a smaller ZEC, the logistic experiment is warmer than the 1 % experiment in the year 1000 by 0.3 ∘C. Figure 10Evolution of atmospheric CO2 concentration and cumulative carbon fractions for logistic and 1 % experiments followed by net zero CO2 emissions. Vertical dotted lines mark the transition from prescribed atmospheric CO2 concentration to zero emissions with free-evolving atmospheric CO2 concentrations. Recall that instantaneous carbon fractions are not defined when emissions are zero (i.e. division by 0). Figure 11b shows the radiative forcing and ocean heat uptake under both the 1 % and logistic ZEC experiments. The figure shows that under the 1 % experiment radiative forcing and ocean heat uptake peak the moment emissions cease, while under the logistic experiment, ocean heat uptake peaks over a century before emissions cease. The declining ocean heat uptake under that logistic experiment explains the smaller ZEC under that experiment. When emissions cease under the logistic experiment, the Earth system is closer to thermal equilibrium, resulting in a smaller radiative imbalance and unrealized warming. These results are consistent with previous experiments examining the pathway dependence of ZEC (Ehlert and Zickfeld, 2017). Figure 11(a) Evolution of global surface air temperature (SAT) anomaly during the transient run and zero emission phase of logistic and 1 % 4× CO2 experiments. (b) Ocean heat uptake (solid lines) and radiative forcing (dashed lines) for each experiment. Vertical dash–dot lines mark transition from prescribed atmospheric CO2 concentration to zero emissions with free-evolving atmospheric CO2 concentrations. Note ocean heat uptake peaks before emissions cease under the logistic experiment. Recent interest in the possibility of net negative CO2 emissions being used to undo climate change through “carbon remediation” (e.g. Shepherd, 2009) has led to the formalization of the 1 %-up, 1 %-down idealized experiment. In this experiment, atmospheric CO2 concentration follows the 1 % experiment up to a given threshold and then is returned to pre-industrial concentration in a mirrored path with −1 % compounded reductions in CO2 concentration each year (Samanta et al., 2010; Boucher et al., 2012; Zickfeld et al., 2013, 2016; Schwinger and Tjiputra, 2018). 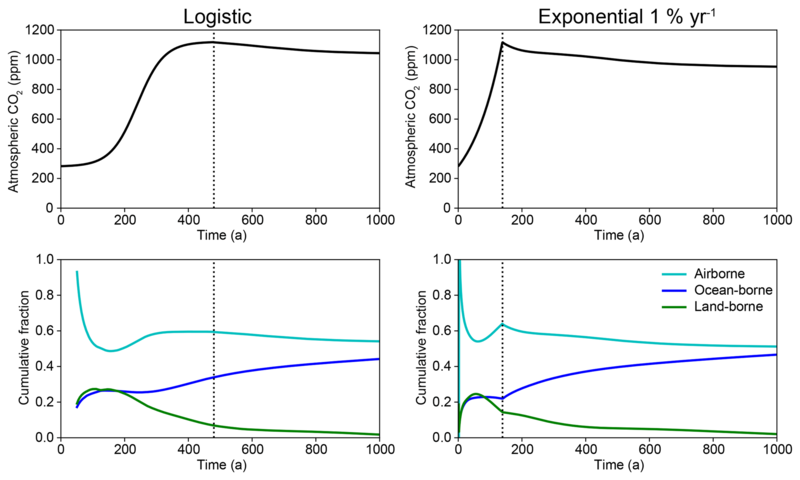 Simulations of the 1 %-up, 1 %-down experiment and the logistic equivalent for 2×, 4×, and 8× CO2 are shown in Fig. 2. 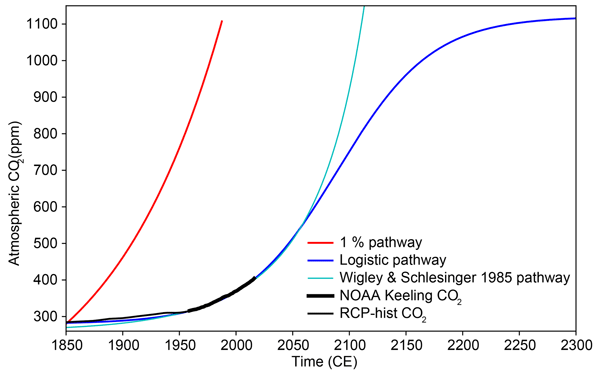 This figure also shows CO2 emissions diagnosed from these pathways. 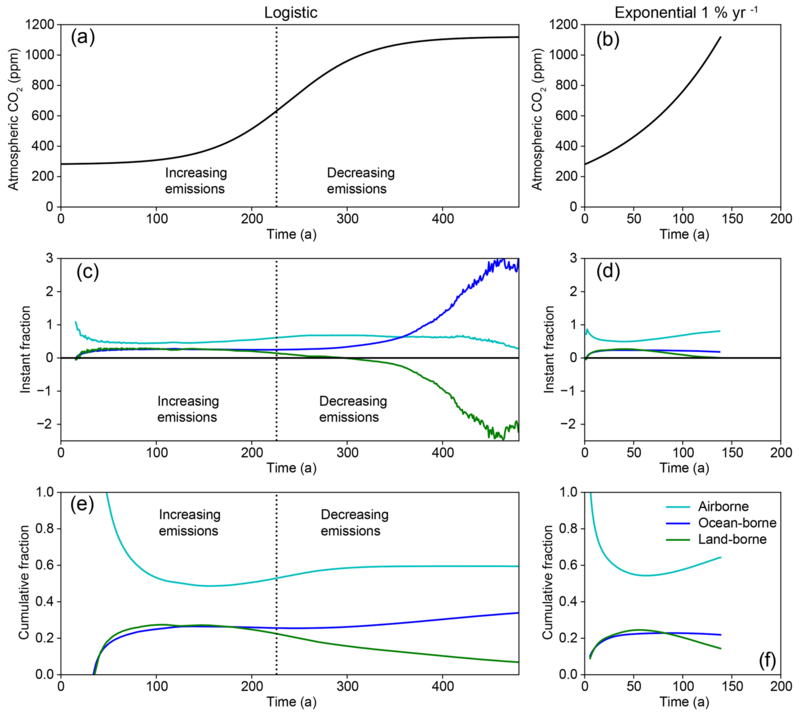 The logistic pathways exhibit a smooth transition to negative emissions, with declining rate of emissions simply continuing to decline once the zero emissions threshold is breached. The 1 %-up, 1 %-down pathways create a transition from very high positive emissions to very large negative emissions over the course of a single year. For example, under the 4× CO2 1 %-up, 1 %-down experiment, emissions go from 29 Pg C a−1 in year 140 of the experiment to −21 Pg C a−1 in year 142 of the experiment. 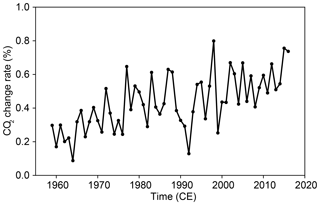 The abrupt change in emission rate also leads to an abrupt cooling of the climate as shown in Fig. 12. The figure shows that the 1 %-up, 1 %-down experiment exhibits a linear increase in temperature followed by a fast but asymmetric cooling of temperature with a long tail of warming which dies out by about the year 500 for the 4× CO2 simulation. The logistic mirrored experiment shows a far more asymmetric temperature curve, with temperature continuing to increase for over a century once CO2 concentration begins to drop (consistent with the ZEC results) followed by a slow decline in temperatures, with temperature still 0.85 ∘C above pre-industrial levels by the end of the simulation in model year 1200. 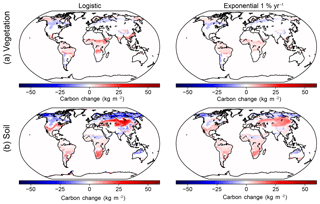 Figure 12Evolution of global SAT anomaly during 4× CO2 1 %-up, 1 %-down and mirrored logistic experiments. Solid lines are the increasing CO2 phase of the simulation and dotted lines are the atmospheric CO2 removal phase of the pathways. A critical question from the early days of coupled carbon cycle modelling was whether the terrestrial carbon sink will transition to a source of carbon to the atmosphere (e.g. Cox et al., 2002). One model in each of the two previous intercomparisons of the carbon cycles of ESMs exhibited a terrestrial sink-to-source transition: HadCM3LC in Friedlingstein et al. (2006) and MIROC-ESM in Arora et al. (2013). However, as all the other models in those intercomparisons did not exhibit a terrestrial sink-to-source transition, this potentiality would appear possible but unlikely (Friedlingstein et al., 2006; Arora et al., 2013). Here, we have shown at least to some degree that the existence of a terrestrial sink-to-source transition is contingent on the choice of idealized experiment used to force a model. Had a logistic experiment been used in previous iterations of C4MIP, different conclusions about the robustness of the terrestrial carbon sink may have been drawn. In order to meet the 2 ∘C temperature target outlined in the Paris Agreement (United Nations, 2015), emissions of CO2 should peak during the present decade (Rogelj et al., 2011; Friedlingstein et al., 2014). Even under less aggressive temperature targets, the emission rate should peak in the early to mid-21st century (Rogelj et al., 2011; Friedlingstein et al., 2014). Thus, examining the behaviour of the carbon cycle under conditions of declining emissions is a area of imminent importance (e.g. Jones, 2017). Here, we have shown that the ocean comes to dominate the global carbon cycle as emissions decline. This feature of the carbon cycle has actually appeared in previous intercomparisons of intermediate complexity ESMs forced with multi-gas scenarios (Zickfeld et al., 2013). However, ocean dominance has not been emphasized in literature. For example, the summary for policy makers for the IPCC AR5 states that “Based on Earth System Models, there is high confidence that the feedback between climate and the carbon cycle is positive in the 21st century; that is, climate change will partially offset increases in land and ocean carbon sinks caused by rising atmospheric CO2. As a result more of the emitted anthropogenic CO2 will remain in the atmosphere” (IPCC, 2013). Although this statement is strictly true, carbon sinks are weaker in fully coupled models relative to biogeochemically coupled models (Arora et al., 2013); the statement does not make clear that if the emission rate peaks then declines, a smaller fraction of emitted anthropogenic carbon will remain in the atmosphere. The more extensive discussion of carbon cycle feedbacks in chap. 6 of AR5 also makes no mention of a higher ocean-borne fraction under declining emission rates (Ciais et al., 2013). Thus, examining the ocean carbon cycle as emissions decrease should be a key priority when analysing the model output of the CMIP6 iteration of C4MIP. A key priority of the CMIP6 iteration of C4MIP is examining the strength of the permafrost carbon cycle feedback to climate change (Jones et al., 2016b), as representations of permafrost carbon were absent from the models that participated in CMIP5 (Arora et al., 2013). Informal intercomparisons of the permafrost carbon feedback have thus far used the year 2100 of RCP8.5 as the point of comparison (Schuur et al., 2015). Given the results of the present study and MacDougall et al. (2017), changing the point of comparison to year 70 of the 1 % experiment is likely to substantially underestimate the potential contribution of permafrost carbon to climate change. Thus, the point of comparison and the lagged nature of the permafrost carbon cycle feedback must be explicitly acknowledged when analysis of the CMIP6 iteration of C4MIP is conducted. Zero emissions scenarios and full mirroring of atmospheric CO2 back to pre-industrial concentration are experiments outside the realm of C4MIP (Jones et al., 2016b) and generally investigated with Earth system models of intermediate complexity (e.g. Zickfeld et al., 2016) or with a single simulation with a full ESM (e.g. Zickfeld et al., 2012; Frölicher et al., 2014). Thus, it is relatively simple for investigators studying these post-emissions states to switch to a logistic-like experiment or a scenario which includes declining emissions. That the choice of which idealized experiment to use can drastically change results of ZEC or negative emissions experiments should gravely concern investigators and reinforce the need for applying critical thought to experiment design. The 1 %-up, 1 %-down experiment in particular needs to be critically examined, as an abrupt transition from very high positive emissions to very large negative emissions is deeply implausible. All idealized scenarios are implausible in some aspects but generally similar events could occur as a component of broader cataclysms. An abrupt transition from high to zero emissions as seen in the 1 % to zero emissions experiment is consistent with a nuclear war obliterating the infrastructure of the fossil fuel economy (Turco et al., 1983). Even the abrupt release of CO2, doubling or quadrupling atmospheric CO2 concentration is more plausible than it may first appear. Paleoclimate evidence from the end-Cretaceous impact event suggests an increase in atmospheric CO2 concentration of about this magnitude, originating from vaporized rock and global firestorms (MacLeod et al., 2018). However, there is no plausible way to decarbonize the global economy and deploy atmospheric CO2 removal technology in a single year. Thus, investigators considering using the 1 %-up, 1 %-down experiment should carefully examine why they are conducting the experiment and whether some other CO2 pathway would be more appropriate. examining the relative strength of ocean carbon uptake during the decreasing emission phases of SSP5-8.5-BGC to 2300 and SSP5-3.4-Overshoot-BGC. The key advantages of the logistic experiment over the 1 % experiment are that the logistic experiment captures the phase of declining emissions and allows for a smoother transition to zero emissions or negative emissions scenarios. The principle disadvantages of switching to the logistic experiment are the much higher computation cost of the experiment and the loss of historical continuity in experiment design. Therefore, several options are available for incorporation of the logistic experiment into the CMIP7 iteration of C4MIP, ranging from full replacement of the 1 % experiment to incorporation of the logistic experiment into the Tier 2 experiment recommendations. Given the high computation cost of feedback separation, which necessitates running fully coupled, radiatively coupled, and biogeochemically coupled simulations (Gregory et al., 2009; Arora et al., 2013), it is prohibitively expensive for the logistic experiment to be used for this purpose. Thus, I recommend that the logistic experiment be added to the Tier 1 set of experiments, in addition to the 1 % experiment, with the logistic experiment used for examining carbon fraction under declining emissions and evaluating the strength of the permafrost carbon cycle feedback. Either the 2× CO2 or 4× CO2 versions of the logistic experiment could be incorporated into the Tier 1 experiments, with the 2× CO2 version having the advantage of being “policy relevant” and less computationally demanding. Idealized scenarios have a long history in the climate modelling community having been used for benchmark experiments and as a means of model intercomparison since the Second Assessment Report of the IPCC (Houghton et al., 1996). In the Fifth Assessment Report, the 1 % experiment was used to compare the behaviour of models which included a representation of the global carbon cycle (Ciais et al., 2013; Arora et al., 2013) and the 1 % experiment will again be at the core of CMIP6 analysis of these systems (Jones et al., 2016b). However, in the 1 % experiment, atmospheric CO2 concentration rises far faster than the historical record and implies only monotonically increasing CO2 emission rate. Therefore, the experiment does not facilitate examination of the carbon cycle under conditions of declining emission rates, nor does the experiment allow for smooth transitions to zero emissions or negative emissions experiments. 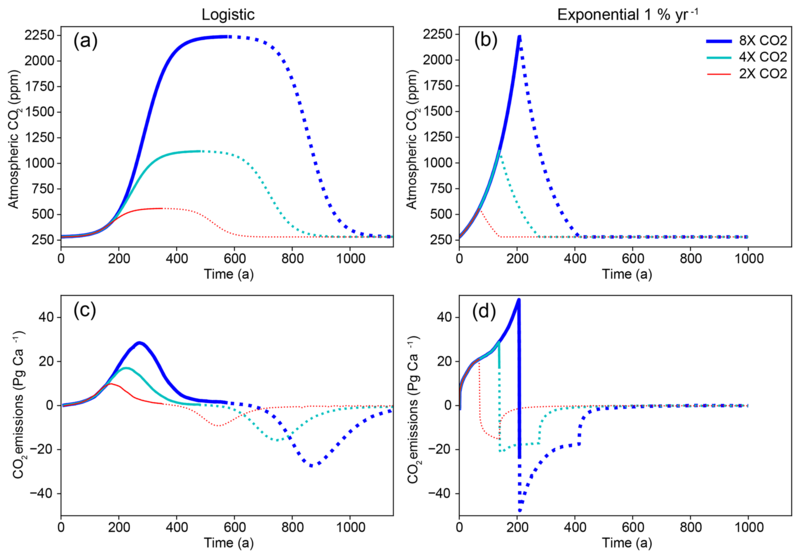 Using a logistic-shaped CO2 concentration pathway allows for study of increasing, decreasing, zero emissions, and negative emissions states and also better matches the historical trajectory of atmospheric CO2 concentration. Simulations forced with the logistic experiment have a terrestrial sink-to-source transition, while simulations forced with 1 % experiment do not. Forced with the logistic experiment, the simulated ocean uptake of carbon comes to dominate the global carbon cycle as emissions decline. Permafrost soils release less than half the carbon at the point of CO2 doubling when forced with the 4× CO2 1 % experiment relative to the 4× CO2 logistic experiment simulations. Following cessation of CO2 emissions, the zero emissions commitment is much larger in simulations following the 1 % experiment than for simulations following a logistic experiment. Simulations with the 1 %-up, 1 %-down experiment exhibit a smaller warming tail than simulations with the equivalent mirrored logistic experiment. These differences suggest that the outcomes of many numerical climate experiments conducted with Earth system models are contingent on the choice of CO2 pathway used to force the model. Overall, I recommend adding a logistic-like experiment to the protocol of the CMIP7 iteration of C4MIP. Model output from the 1 % and logistic experiments described here is available for download from http://wiracocha.stfx.ca:5000/sharing/pZYta8JrV (MacDougall, 2018). Version 2.9 of the UVic ESCM is available for download from http://climate.uvic.ca/model/ (Weaver and Eby, 2015). The updated model code including the frozen ground version of the model can be downloaded from ftp://uvicgroup@data.iac.ethz.ch/. Forcing files containing the CO2 trajectories used for the numerical experiments described here are available in the Supplement. Output variables necessary to reproduce the above numerical experiments are identical to those described in the C4MIP protocol. Refer to Sect. 4 of Jones et al. (2016b) for a detailed description. The supplement related to this article is available online at: https://doi.org/10.5194/gmd-12-597-2019-supplement. This research was supported by a grant from the NSERC Discovery Grant programme. I thank Compute Canada for supercomputer resources and support. Ronald J. Stouffer graciously provided an account of the of the origin and original purpose of the 1 % experiment. I thank Chris Jones and Antti-Ilari Partanen for their thoughtful and critical reviews of the manuscript.